New Forest foxes are not usually easy to observe – generations of mistreatment at the hands of man has seen to that. But many fox field signs are relatively commonplace and provide clues to the habits of these fascinating creatures. Fox paw prints can sometimes be seen on New Forest woodland rides or around foxes' dens, although the ground, particularly around dens, is often hard, compacted and unlikely to show much at all. 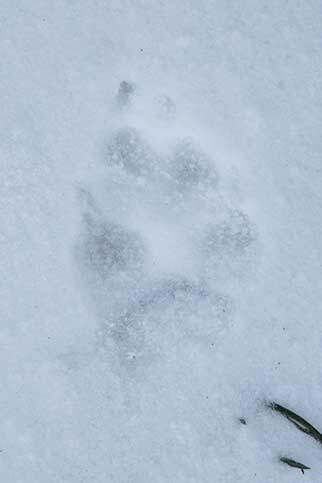 (Snow perhaps offers the best opportunities for observing animal trails: it's usually soft enough for prints to be left yet, especially after a moderate frost, firm enough for prints to be retained whilst the cold weather remains). But separating fox prints from dog prints can sometimes be a challenge for both, not surprisingly, can be remarkably similar. (It's always useful to remember that fox trails are typically straighter, more purposeful than the often erratic courses taken by dogs). Both fox and dog paws have four toe pads - two in front and one on each side - with a heel to the rear, and both are likely, to greater or lesser extent, to leave claw prints. 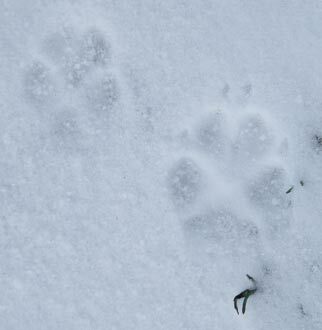 Fox prints are, however, typically narrower than those left by dogs. (Beware, though, for fox and other animal prints can vary slightly in shape and size, depending upon factors such as the softness of the ground and the speed at which the animal was travelling). The images illustrate the potential for variety in both shape and size. Both were taken a few feet apart along the same fox trail. The lone print in the larger image and the larger of the two prints in the smaller image are fairly narrow and therefore typical of those left by a fox, whilst the third print is a slightly smaller, rounder example, probably left by a hindfoot. Fox droppings can often be seen on New Forest woodland rides, frequently deposited as territorial markers on raised objects such as mossy hillocks, fallen sticks or molehills. They are often firm, slender, quite long, cylindrical and curled at one end. Even without close examination, they can usually be seen to contain copious amounts of fur, bits of bone and sometimes also feathers and beetle wing cases. Scatterings of feathers – wood pigeon remains are particularly common - are sometimes found littering the ground in New Forest woodlands. Quills when bitten off indicate a fox as the hunter, as birds of prey tend to pluck the feathers without damaging the quills. 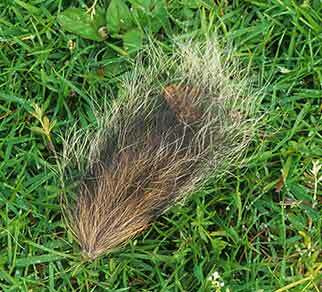 Grey squirrel skins, turned inside out, are also sometimes encountered, and so are the severed tips of squirrels’ tails. 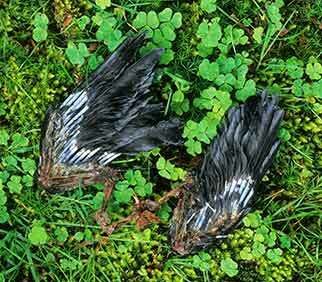 Both New Forest foxes and buzzards prey on these animals. 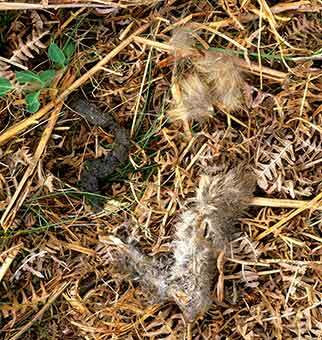 Shrews found dead on New Forest paths probably indicate the work of a fox. 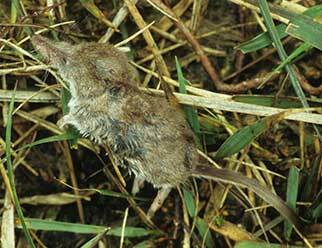 Shrews are, though, considered by foxes to be unpalatable, and are not often devoured. Foxes often take over part of a rabbit warren for use as a breeding den, or cohabit with badgers. Occupation by a fox family often goes unnoticed, though, until the cubs start to regularly venture above ground, which is usually in late-April or May. Then, fox prey remains brought back by the parents are often left to litter the vicinity of the den. (Rarely do badgers leave food item remains above ground). 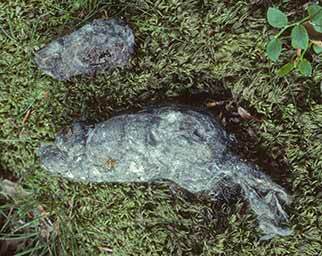 Fox cub droppings – miniature versions of those left by adults – also betray a fox family’s presence. (Adult fox droppings are not often found around the dens – adults are usually too wary to leave signs such as this, although occasionally droppings found in mid-winter help identify likely breeding dens). Foxes are prolific scent-markers - they leave lingering, strongly musky, pungent calling cards at strategic places around their regularly used beats and no doubt other scents that escape the attention of human noses. And the purpose? To mark out territory, to communicate with mates (and where applicable, with other members of their social group) and to give notice of presence to other foxes and thereby discourage interlopers from encroaching. Fox scent is contained within urine and droppings, and is also deposited from glands on, for example, the fox’s paws and close to the base of the tail. It can often be detected by our relatively insensitive human noses – it hangs on the air for lengthy periods of time and has a strong, earthy aroma that is not wholly unpleasant.